I bake a lot, and a lot of the recipes I’ve tried come from Martha Stewarts website, and Martha recommends King Arthur flour, so ofcourse I had to try it. This flour makes all your baked goods so much better. Its all purpose so I use it for everything, cakes, cookies, even some of the breads (although they carry a lot of specialty bread flours as well). Their website says they use the best American wheat, and if you’ve normally used store bought brands, this flour will show you that there is a difference. 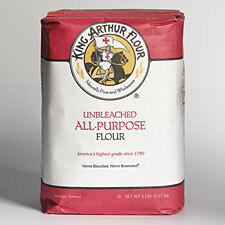 I was buying it online from http://www.kingarthurflour.com/ which has a plethora of baking ingredients and bakeware, mixes and recipes – but then I found out that my local pathmark grocery store also carries King Arthur, so now I buy it at the store. A great value at about $5 for a 5 lb bag.